It is 18 years since Selkirk race horse trainer Stuart Coltherd saddled his first National Hunt winner. 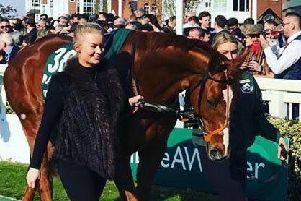 Those who know the 50-year-old won’t be surprised to learn the horse which brought Stuart that initial success back in 1999, Murder Moss, can still be found grazing contentedly in a field close by Coltherd Racing’s Clarilawmuir yard. “He’s now 27-years-old,” says Stuart, “but is a real character and helps show the ropes to youngsters when they’re first brought into the yard. “I bought him as a two-year-old at Doncaster for £700, expecting to sell him on after a couple of years or so. Stuart took out a permit to train his own horses in 1999, and gained his full trainer’s licence five years later. He remembers that first victory with Murder Moss as if it was yesterday. “I was 32 at the time, and as well as being Murder Moss’ trainer I was also his jockey. The win came at Hexham on May 1, 1999, in a race called the Heart of All England Maiden Hunters Steeplechase. “There were 18 runners, and I was keen to make a fast start and stay out of trouble. “Ex-Langholm Cornet Tommy Morrison and I set the pace for virtually the whole of the race, and Tommy’s horse jumped the last fence just in front. After the race, Stuart was told by a Hexham official he could keep the winner’s trophy, but if he did then he would have £100 docked from his prize money. Stuart recorded his 100th winner over fences when Ash Park won at Musselburgh in March, and the nine-year-old gelding will be one of three horses from the Coltherd Racing stable in action at Kelso’s Hallowe’en meeting this Saturday. All three runners are likely to be piloted by Stuart’s 18-year-old son Sam, an up-and-coming conditional jockey who has recently joined Yorkshire trainer Sue Smith’s Craiglands Farm yard. ● Meanwhile, Coltherd Racing has just revealed the identity of its new yard sponsor – Terroir Wines.